Lee McClelland has left Wakehurst to re-join Ballymoney United. Picture: Press Eye. Wakehurst return to action on Saturday, aiming to give their troubled season a much-needed cup boost. The Ballymena men travel to face Portstewart in their delayed IFA Intermediate Cup game. Since Wakehurst’s last game, there have been a number of departures from the club. 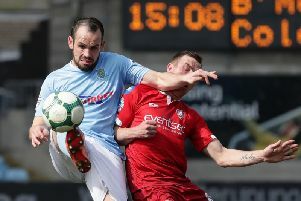 Bradley Cairns, who made his debut earlier this season at the age of 16, has joined Ballymena United, while Lee McClelland - who had captained the side earlier in the season in the absence of regular skipper George Young - has re-joined Ballymoney United. Craig McCaughern has also left the club to return to Saturday Morning League football, with Carniny Rangers. It means interim boss Dougie Stevenson has had to dip into the club’s reserve team, who have been flying high at the top of Junior Division Two in the Ballymena & Provincial League, in order to bolster his squad.